To be frank it is annoying i have to keep asking, il ask for you to answer these again and if they arent answered il come to the conclusion of your hiding something you dont want us to know and i will be voting no and doing some digging. The floor is all yours. I dindt left Anon Now ! 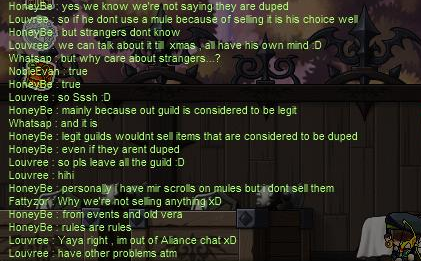 From Bonded's perspectice mircs are considered as duped items, would you stop selling such items if you were accepted to the guild? I had a quick chat from one of the members from anonymous, and they said you had some issues with their rules. Unfortunately, our rules are very similar as are most guilds rules. I will vote No. Because, I feel if you have issues in anonymous regarding the rules you will be in the same situation here in bonded. Good luck with your apply. @BennetWitch would you like to specify which rules that the applicant seemed to have trubbles with? The person i spoke with didn't specify which ones. Very well then, Sylvana maybe you could inform us which rules that you disagreed to follow in Ano? I only have this question out of curiosity; Why haven't you left anonymous yet? I want to hear your answers on the questions my fellow mates proposed, before voting. Also, I'm asking about your equips: are they self-made, scrolled and cubed? I also find it a bit suspicious that you said you had started MSE in 2006. Europe was actually released in 2007, assuming that you didn't play the closed beta. You said you'd been in Hells Angels for 8 years and your longest inactivity period was one year. How come you didn't even try to find a guild in those 8 years, and only stayed in your second guild for 2 weeks before applying here? Phew, that's a lot of stuff. I hope you'll carefully answer these and the other questions throughout. I'll hold my vote for now. I never said I have any problems with Ano Rules also I know Bonded Forum is a Copie of Ano Forum too same Rules same Question for Apply , Show me the one who said anything like that ? .. because I never said something like Rules maybe you mean Dome ?. @Pillow , I dindt left Ano because like Ashe know 1. I was to going to check How is Bonded 2. I wasnt really sure to join because I dindt know anyone of you guys 3. next time I never hear on someone who ask me to join a Guild because they will be nice ! LouLou85 wrote: I never said I have any problems with Ano Rules also I know Bonded Forum is a Copie of Ano Forum too same Rules same Question for Apply , Show me the one who said anything like that ? .. because I never said something like Rules maybe you mean Dome ?. Then why is it when i asked 2 people from anonymous that they said the same, you didn't like their rules, and wanted to leave with Domé to join Ashe in bonded, you had been asked before why not join ashe before you joined ano and didn't seem interested, so why now? my vote still stands as a no. I wont be revealing their ign's/names as both members deserve at least some confidentiality. 60% of my Items are selfmade .. other one I bought on Fm from trustable ppl . I dindt has a ground to leave HellsAngels or find a other Guild in these 8 years , I was fine with them all , till this moment when all break down, I went to Ano I did not feel comfortable there so I had a talk with Ashe she aske me if ima join Bonded , I told her I want to know more about Bonded, so I start to know more about all ..
Rather than speaking to 2 members from a guild who have "issues" with us, it'd be best if you spoke to Sylvana in this instance as she never said she had issues with their rules in the application. I understand that you may think that we ask alot of questions and I'm sure that you find most of them useless, however if you try to see this from our point of view I got a little suspicious when people from your old guild claim that you had trubbles with their rules when our are more or less identical. As i tend to protect my guildies, i will clean this slate. I was asked about Syl. Indeed Syl never said she did not agree to the rules. Reading between the lines, she implied not agreeing to them. Maybe it was because she was upset because Domè just left, when he was told he could not sell his self-earned winters in his shop, I don't know. And yes I got the screenshots, but I don't think i need to provide them. - Domè his english is very poor. But he said so himself in his application. Hope to have cleared the void. Thank you for providing us with your side of the story. As we can tell, sylvana's English isn't the best, but I personally do not expect everyone on ems to speak perfect English.. as long as it's adequate to make conversation, I feel it's no reason not to even give them a chance. Despite all that is going on here, sylvana did not once state she will not follow our rules. In fact, she expressly agreed to follow them. Domè has agreed to abide by our rules, including the one that caused the conflict in your old guild. So in my eyes, this matter has been settled. With that, I have no further questions and vote yes. I do not want to intervene in your applying process but there are a few things that I would like to clarify as it is claimed that anony members are liars. you saying that we are simple minded for trying to explain to you why we have those rules that you seem to disagree with obviously implies that you disagree with them. We are not kids we do not say everything we tend to mean. Hint: read between the lines. you saying if he wants to sell those items on main and all leave guild implies that you are okay with breaking the rules and that you are in fact, against them. Don't get me wrong I wish you the best of luck in bonded or any other guild but lying about it to make anony members appear to be the liars is not an option. LouLou85 wrote: I know it was Killian and Hanna who cares They should tell it to me .. but they can't because i dindt say anything about rule Very Happy , even i dindt left with Dome . enjoy"
As a jr if any other guild asks me why someone left or quit anony, I will explain to them and be clear about it nothing to hide and nothing to lie about. Nothing personal here you could be a nice person but I don't know you, don't get me wrong but I couldn't care less if you stayed in anony or left because most of the times you were afk from alliance chat. We tried to talk to you about you disagreeing with the rules but you quit and no need to drag Kilian into this. I'm not trying to prevent them from adding you as I already said, it has nothing to do with you or them. I wish you the best of luck but there's no need to call us liars. Oh come on Hanna that's so lame of you , I'm surprised that you show us the half of the screens. I crashed the conversation , because Whatsapp was asking about Dome's Guild quit- I said to some question from him : (so if he don't use amule to selling it. is his choice, well).And I wasnt care about that he sold Winter (even it wasn Winter Exp, just Winter 20% add). about all have to quit the Guild it was because to be legit , (that's means No one is on one way legit ).and , Yes ofc I said maybe some harsh words (oh wait maybe I was really mad of you guys)Why It could be ?. Whatever the situation is, Bonded's application page is not the place to dissolve personal battles. We appreciate your input, but please do so without malice. We appreciate facts, just don't get defensive or this will not end well for anyone. Any further comments made with an element of malice will not be tolerated. I don't know you (yet), but I will give you a chance, yes from me! Your application has been accepted. Please create an account on the forum with your main IGN as the user, and contact HyakkaRyou, LTeureka, or Teale to be invited to the guild.